I came across this inspirational video in YouTube- featuring Don Avery. 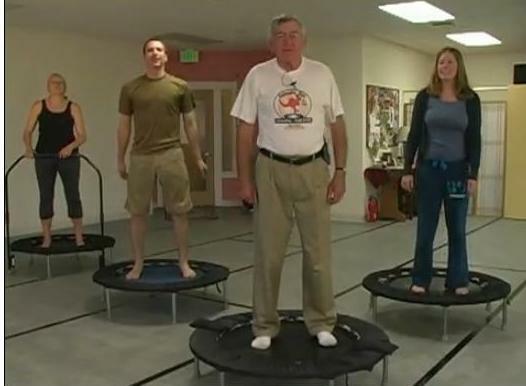 Rebounder is now used as one of the rehabilitation exercises for physio and by chiropractors as the exercises are low impact and does not stress the joints (but if you bounce vigoriously on a rebounder, your joints would still absorb the pressure). Wear a pair of good sports shoes while doing exercises on a rebounder. He is almost 80 years old (when the video was shot in 2009) and in good health because he said he was exercising on a rebounder. In 1976, he broke one of his leg while climbing a mountain with his sons. He did not realised he broke his leg because his mind was on savings his sons- it was only in the hospital (because he sent one of his sons who broke his arm) that he was told he broke his legs. For the next 5 years, he could never run 5 miles anymore- which used to be his routine exercise. He asked himself- with the injury, could he do what he ahd done before? He found the answer with rebounding. He himself demonstrated some of the exercises. 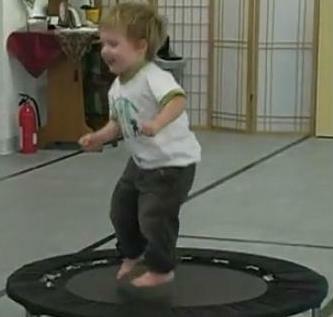 In the video, you can also see how fun it can be to exercise with kids and get them interested and keep them healthy. Note: Before beginning any exercise, it is important to check with your doctor especially if you have existing medical conditions like high blood pressure, low blood pressure, heart problems, vertigo, overweight, injuries, etc. Always warm up first before doing rebounding and start with light exercises- as you are getting more used to the rebounder, then you may proceed slowly. Advanced Cancers- to opt or treatment or otherwise?